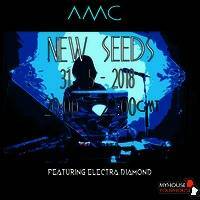 Here's the live recording of the second New Seeds show in May 2018. Following the fire of waterfront dining, I'm super stoked to have Electra Diamond on the show. Her mix features brand new material from her latest EP "Dance to forget" and across her back catalogue including an exclusive version of "S M I L E". Before the mix you'll hear brand new sounds from Begin, Pacific Coliseum, b o d y l i n e, Prefuse '73 and more, plus at the end a triple header of source sample material from last months plea!